This score is so outrageously funkalicious, I challenge anyone to remain seated while listening to it. If you can accomplish that feat, I'll call you a hearse, 'cause you ain't got a pulse. "THE SPLIT is the best CD which was ever produced" !!!! He normally doesn't buy CDs, but vinyl only, used or new - but since I know that he's totally into 60s and 70s funk soundtracks and similar stuff and digs the great Q a lot, I pointed him to that album the moment the sound clips appeared online at SAE. Luckily with the biggest possible effect. Needless to say, I myself love the album immensely as well and there's a very good chance that at the end of the year it will be my favourite soundtrack release of 2009. I'm listening to THE SPLIT nearly every day since its release. Listening to it right now, and enyoing it greatly. What a score! Where are scores like these today, that really thrill me? Love it! CASH really is a top notch score. If you enjoy jazzy and funky, this is a must have in your collection. I have also recently purchased Alex Wurman's CRIMINAL. Again, a really enjoyable listen in a similar vein. I also have ANALYZE THAT by David Holmes, which I have yet to listen to, but from the previous sound clips I have heard, this will be an equally enjoyable listening experience. I also have THE SPLIT, but I am going to savour the anticipation of listening to it for as long as possible. I'll play the heretic - I could do without the songs, mostly. The orchestral selections are topnotch, of course. ever released his wild, jazzy score for the unofficial remake of MIRAGE, JIGSAW. I love the main title song too! I might play it in one of my future radio shows. Quite catchy! I just love all the songs and score on this one. 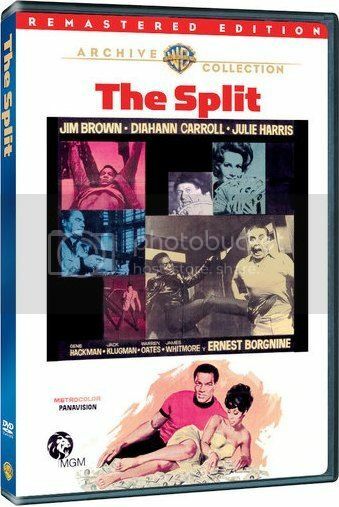 "The Split" has been issued on MOD DVD-R by the Warner Archive. I keep hoping Turner Classic Movies will show The Split at some point, as I don't blind-buy movies anymore (I love the soundtrack and the "Parker" books). Pretty good movie. A very loose adaptation of the book, but that's par for the course with Richard Stark "Parker" adaptations. Great cast, and Jones' score keeps everything pulsating right along.